Frank Oz (born Frank Richard Oznowicz; May 25, 1944) is an American actor, puppeteer, director and producer. His career began as a puppeteer, where he performed the Muppet characters of Miss Piggy, Fozzie Bear, Animal, and Sam Eagle in The Muppet Show, and Cookie Monster, Bert, and Grover in Sesame Street. He is also known for the role of Yoda in the Star Wars series, in which he has performed and provided the voice for the character in several films and television series. His work as a director includes Little Shop of Horrors (1986), Dirty Rotten Scoundrels (1988), What About Bob? (1991), In & Out (1997), Bowfinger (1999), The Score (2001), Death at a Funeral (2007), and an episode of the US TV series Leverage (2011). Oz was born in Hereford, England, United Kingdom; the son of Frances (née Ghevaert; 1910–1989) and Isidore Oznowicz (1916–1998), both of whom were puppeteers. His father was also a window trimmer. His parents moved to England after fighting the Nazis with the Dutch Brigades. Oz's Dutch-Polish father was Jewish and his Flemish mother was a lapsed Catholic. They left England when he was six months old and lived in Belgium until he was five. Oz and his family moved to Montana in 1951. They eventually settled in Oakland, California. Oz attended Oakland Technical High School and Oakland City College. He worked as an apprentice puppeteer at Children's Fairyland as a teenager with the Vagabond Puppets, a production of the Oakland Recreation Department, where Lettie Connell was his mentor. Oz is known for his work as a puppeteer, performing with Jim Henson's Muppets. His characters have included Miss Piggy, Fozzie Bear, Animal, and Sam Eagle on The Muppet Show, and Grover, Cookie Monster and Bert on Sesame Street. In addition to performing a variety of characters, Oz has been one of the primary collaborators responsible for the development of the Muppets over the last 30 years. Oz has performed as a Muppet performer in over 75 productions including Labyrinth, video releases, and television specials, as well as countless other public appearances, episodes of Sesame Street, and other Jim Henson series. His puppetry work spans from 1963 to the present, although he semi-retired from performing his Muppets characters in 2001. In 2001, his characters were taken over primarily by Eric Jacobson (with David Rudman as Cookie Monster). "One was that I was a dad, I have four kids. The reason was that I was constantly asked to do stuff. And also, I'd done this for 30 years, and I'd never wanted to be a puppeteer in the first place. I wanted to be a journalist, and really what I wanted to do was direct theatre and direct movies. So it was more a slow progression, working with Jim, but I felt limited. As an actor and a performer, you always feel limited because you're not the source of the creation, and I wanted to be the source. I wanted to be the guy and give my view of the world. And if I screw it up, I screw it up, but at least I tried. And as a director, what you're really showing is you're showing the audience your view of the world...I've always enjoyed, more than anything else in the world, bringing things to life, whether it's characters or actors in a scene or moments in movies. I've done so much with the puppets, that I'd always wanted to work with actors." Oz is also known as the performer of Jedi Master Yoda from George Lucas' Star Wars series. Jim Henson had originally been contacted by Lucas about possibly performing Yoda. Henson was preoccupied and instead suggested Oz to be assigned as chief puppeteer of the character, as well as a creative consultant. Oz performed the puppet and provided the voice for Yoda in The Empire Strikes Back (1980), Return of the Jedi (1983), Star Wars: Episode I – The Phantom Menace (1999), and Star Wars: The Last Jedi (2017). Oz also provided the voice of the computer-generated imagery (CGI) Yoda in Star Wars: Episode II – Attack of the Clones (2002) and Star Wars: Episode III – Revenge of the Sith (2005). The conversion to CGI was met with some criticism among fans, but Oz himself said that was "exactly what [Lucas] should have done." Oz had a great deal of creative input on the character and was himself responsible for creating the character's trademark syntax. Oz returned to voice Yoda in Disney's Star Tours–The Adventures Continue attractions and in the Star Wars Rebels episodes, "Path of the Jedi" and "Shroud of Darkness." "I think it opened up my view of film — that there's so much more that could be done. Actually, by breaking so many rules, he allowed other people to say, 'Hey, I can maybe think of some stuff, too!' He just opened up the possibilities more for me. That's what he did." Oz began his behind-the-camera work when he co-directed the fantasy film The Dark Crystal with long-time collaborator Jim Henson. The film featured the most advanced puppets ever created for a movie. Oz further employed those skills in directing 1984's The Muppets Take Manhattan, as well as sharing a screenwriting credit. In 1986, he directed his first film that did not involve Henson, Little Shop Of Horrors. The musical film starred Rick Moranis and Ellen Greene, as well as Vincent Gardenia, Steve Martin, Bill Murray, John Candy, Christopher Guest, Jim Belushi and a 15-foot-tall talking plant (voiced by Levi Stubbs) which at times required up to 40 puppeteers to operate. The film allowed Oz to show his ability to work with live actors and led to opportunities to direct films that did not include puppetry. Usually helming comedic productions, Oz went on to direct Dirty Rotten Scoundrels in 1988, starring Steve Martin and Michael Caine; What About Bob? in 1991, starring Bill Murray and Richard Dreyfuss; and Housesitter in 1992, starring Steve Martin and Goldie Hawn (all of which were scored by Miles Goodman). Later films include The Indian in the Cupboard (1995), In & Out (1997), Bowfinger (1999), The Score (2001), the 2004 remake of The Stepford Wives, and the original Death at a Funeral (2007). Oz has frequently experienced on-set tension while directing his films, notably during the productions of What About Bob?, In & Out, The Score and The Stepford Wives. Oz was also considered to direct other films such as Mermaids (1990), Harry Potter and the Chamber of Secrets (2002), and Dreamgirls (2006). As an actor, Oz appeared in one scene as a Prison Storeroom Keeper in The Blues Brothers (1980), directed by John Landis. He appeared in a similar role and scene in Trading Places (1983), also directed by Landis. He had roles in several other Landis films including An American Werewolf in London (1981), Spies Like Us (1985), Innocent Blood (1992) and Blues Brothers 2000 (1998). In 2001 he had a voice acting role in the Pixar film Monsters, Inc. as Randall's scare assistant, Fungus. In 2005, he had a minor part in the Columbia film Zathura as the voice of the robot. Other cameos have included playing a surgeon in scenes cut from the theatrical release of Superman III, The Muppet Movie, The Great Muppet Caper, The Muppets Take Manhattan and several other Jim Henson-related films that did not involve just his puppeteering. Even if he does not appear in a Landis movie, his name is often spoken in the background. During airport scenes in Into the Night and Coming to America, there are announcements on the PA system for 'Mr. Frank Oznowicz'. Oz was previously married to Robin Garsen. He is now married to Victoria Labalme. Oz is the father of four sons. He maintained a residence in England for nine years and currently resides in Manhattan (as of 2012). Additional characters Puppeteer/Voice; semi-retired from the show in 2001, now performs his characters a few episodes per year, until 2012. 2011 Leverage Yes No Episode: "The Carnival Job"
^ a b c d Peterson, Karen; Hauptfuhrer, Fred (9 June 1980). "Yoda Mania". People. Retrieved 8 December 2015. ^ a b c "A Conversation with Frank Oz at the Museum of the Moving Image". Jimhensonlegacy.org. October 25, 2011. Retrieved March 23, 2012. ^ a b c d Paquette, Danielle (July 26, 2012). "Frank Oz speaks — but not as Yoda or Miss Piggy". Los Angeles Times. Retrieved December 8, 2015. ^ "Frank Oz Biography – Yahoo! Movies". Movies.yahoo.com. Archived from the original on 2011-06-28. Retrieved September 26, 2011. ^ "Wayback Machine" (PDF). web.archive.org. February 22, 2014. Retrieved February 16, 2019. ^ a b Plume, Kenneth (18 February 2000). "Interview with Frank Oz (Part 1 of 4)". IGN. Retrieved 8 December 2015. ^ "Oz L.A. Times Score article- Edward Norton Information Page". Workprint.powweb.com. 2001-07-09. Archived from the original on 2011-09-02. Retrieved 2011-09-26. ^ "JewishJournal.com". JewishJournal.com. Retrieved 2011-09-26. ^ Arnold, William (2007-06-08). "''seattlepi.com'' "Director Frank Oz takes a new tack with low-budget dark comedy, 'Death at a Funeral'" William Arnold, 6/8/07". Seattlepi.com. Retrieved 2011-09-26. ^ a b c Clark, John (12 August 2007). "Frank Oz and that little voice inside". Los Angeles Times. Retrieved 1 December 2015. ^ a b c Rabin, Nathan (16 August 2007). "Frank Oz". The A.V. Club. Retrieved 10 August 2015. ^ "Children's Fairyland". The New York Times. February 5, 2011. Retrieved 10 April 2013. ^ "International Puppet Museum: Lettie Connell Schuburt". Puppetrymuseum.org. Retrieved 2011-09-26. ^ Setoodeh, Ramin (11 March 2014). "How Kermit and the Muppets Got Their Mojo Back". Variety. Retrieved 12 March 2014. ^ Lloyd, Robert (May 16, 2015). "If Harry Shearer leaves 'The Simpsons,' what will happen? Just ask Bugs Bunny". Los Angeles Times. Retrieved May 20, 2015. ^ merrick. "Capone With Frank Oz About DEATH AT A FUNERAL, What Went Wrong On STEPFORD, And (Of Course)..." Aint It Cool News. Retrieved February 16, 2019. ^ Gray, Tim (January 15, 2018). "Rian Johnson Answers All Your Spoilery 'Star Wars' Questions About Luke And That Surprise Cameo". Variety. Retrieved January 16, 2018. ^ Geoffrey K. Pullum (May 18, 2005). "Yoda's syntax the Tribune analyzes; supply more details I will!". Language Log. Retrieved 2010-09-30. ^ "Countdown to an All-New Star Tours | Fans Insider | Disney". Disney.go.com. 2011-05-10. Retrieved 2011-09-26. ^ Rabin, Nathan. "The Film That Changed My Life: 30 Directors on Their Epiphanies in the Dark (9781556528255): Robert K. Elder: Books". Amazon.com. Retrieved 2011-09-26. ^ Oz, Frank. Interview by Robert K. Elder. The Film That Changed My Life. By Robert K. Elder. Chicago: Chicago Review Press, 2011. N. p. 272. Print. ^ "Capone With Frank Oz About Death at a Funeral, What Went Wrong On Stepford, And (Of Course) Yoda!!". Ain't It Cool News. 7 August 2007. Retrieved 19 July 2015. ^ Plume, Kenneth (10 February 2000). "Interview with Frank Oz". IGN. Retrieved 27 April 2015. ^ "Nicole Kidman-Frank Oz's Tense Remake". contactmusic.com. 2003-02-10. ^ Murphy, Ryan (November 15, 1992). "A look inside Hollywood and the movies. : DEVELOPMENT HELL : 'Interview With a Vampire' and 'Dreamgirls' Looking Good to Ascend". Los Angeles Times. Retrieved November 24, 2018. ^ Paquette, Danielle (12 July 2012). "Frank Oz speaks — but not as Yoda or Miss Piggy". The Los Angeles Times. Retrieved 4 February 2013. ^ "Pixar's 'Inside Out' Cast Includes Some Awesome Voice Cameos (Spoilers)". Stitch Kingdom. May 20, 2015. Archived from the original on May 22, 2015. Retrieved May 27, 2015. ^ "J.J. Abrams reveals Obi-Wan and Yoda are secretly in 'Star Wars: The Force Awakens' - EW.com". ^ "A Frank Oz-Directed Muppet Show Documentary Is Coming - Muppet Fans Who Grew Up - Tough Pigs". 31 January 2017. ^ "Muppet Guys Talking - Secrets Behind the Show the Whole World Watched". ^ "Frank Oz – Awards". IMDb. Retrieved 2013-06-14. 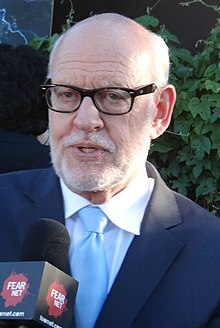 Wikimedia Commons has media related to Frank Oz.